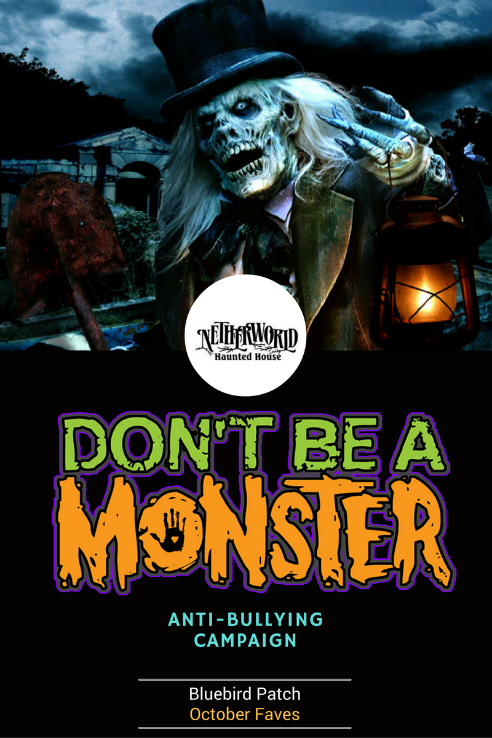 ATLANTA: The nationally-acclaimed seasonal attraction, NETHERWORLD Haunted House, has partnered for the fourth year with the “Don’t Be A Monster” anti-bullying campaign. The campaign begins at Atlanta area schools inviting students to enjoy engaging presentations from monsters and staff members of NETHERWORLD, while they discuss how to take a stand against bullying. Founded during the 2012 Halloween season, “Don’t Be A Monster” started in San Antonio as a pilot program partnering the non-profit Organization City Year with the 13th Floor Haunted House. Visiting eight local schools and spreading the message to over 5,000 students, the pilot program was a success and encouraged haunted house co-owners, Chris Stafford and Jon Love, to form Imagine Better, Inc., an organization to combat bullying and expand the “Don’t Be A Monster” campaign. NETHERWORLD Haunted House is a founding board member of this organization and continues to help guide and expand the charities growth and success. Each assembly focuses on the role of an Upstander. “Don’t Be A Monster” works to teach students ways that they can be an Upstander in school. During each presentation, participants discuss what constitutes bullying, what to do if it happens to you or you see it happening to someone else, diversity, acceptance, inclusion, and above all: kindness. Each presentation will begin with a six minute video highlighting a day in the life of ‘Frank’, who is constantly bullied. Following the video,NETHERWORLD representatives will hold a 30 minute presentation using audience participation to exemplify ways of how to spot bullying and how to act as an Upstander against the actual monster, the bully. One in three students report being bullied in school and the numbers continue to rise. NETHERWORLD, Atlanta’s popular self-guided, dark attraction, is one of the most highly-acclaimed Haunted Houses in the world. Known for its over-the top special effects, unique make-up, elaborate costuming, skilled stunt actors and unusual themes and details,NETHERWORLD has established itself as an Atlanta tradition. Since the attraction first opened 20 years ago, NETHERWORLD has been voted by publications such as Hauntworld Magazine, Dead Central, Fangoria and USA Today as the top haunt in the nation as well as been recognized both locally and nationally by media including CNN, The Today Show, The Early Show, The Travel Channeland Wall Street Journal. Every season, this innovative horror experience continues to draw in generations of thrill seekers eager to see what new nightmares have been released! NETHERWORLDis open nightly beginning Friday. Tickets range from $23 to $55. For more information, visit www.fearworld.com or call 404-608-2484. Keep up with all things spooky by following NETHERWORLD Haunted House on Facebook, Twitter and Instagram.